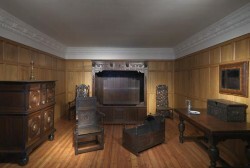 A display of 17th century furniture. (Click on image to enlarge). 18th century elegance. (Click to enlarge). A new exhibition at the furniture galleries of the National Museum of Ireland is shown in a series of room settings. 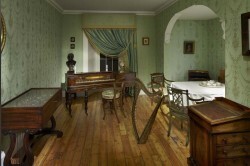 There is a 17th century bedroom with a rare Flemish stand-bed, oak chests and panelling, a refined Georgian dining room, a 19th century music room with an Irish invention, the idiophone or musical glasses, and a 20th century furniture gallery displaying Irish modernism from 1900 to the present. This includes Arts and Crafts pieces from the Kilkenny woodworker’s colony, Art Nouveau chairs from the Paris exhibition of 1900, an Irish Art Deco bedroom, and the thoroughly modernist style of a 1950s living room. There is work by some of Ireland’s best contemporary furniture designers; Joseph Walsh, Nest Furniture Design, John Lee, Zelouf and Bell and a block screen inspired by Eileen Gray created by Sasha Sykes. International furniture not shown for many decades explores the theme of ancient chests, coffers and boxes. There is a Renaissance bridal chest, a 15th century Spanish pilgrimage chest and a rare Persian coffer, covered in mother of pearl. 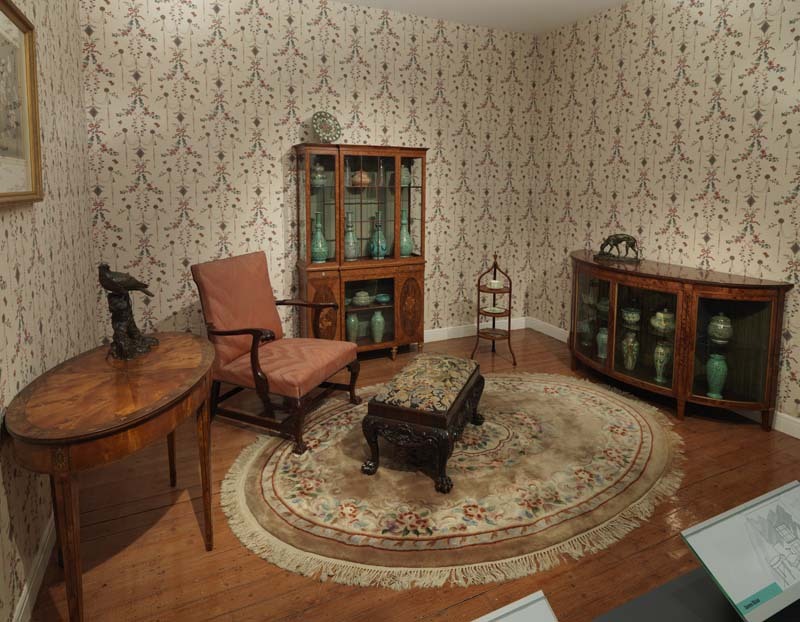 Tracing the development of furniture in Ireland from 1600 to the present the exhibition is enhanced by textiles, silver, glass and ceramics and an accompanying interactive gallery. It can been seen on the second floor of the National Museum of Ireland – Decorative Arts & History, Collins Barracks, Dublin. 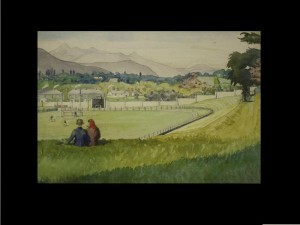 All images are copyright National Museum of Ireland. The James Hicks room. (Click to enlarge). 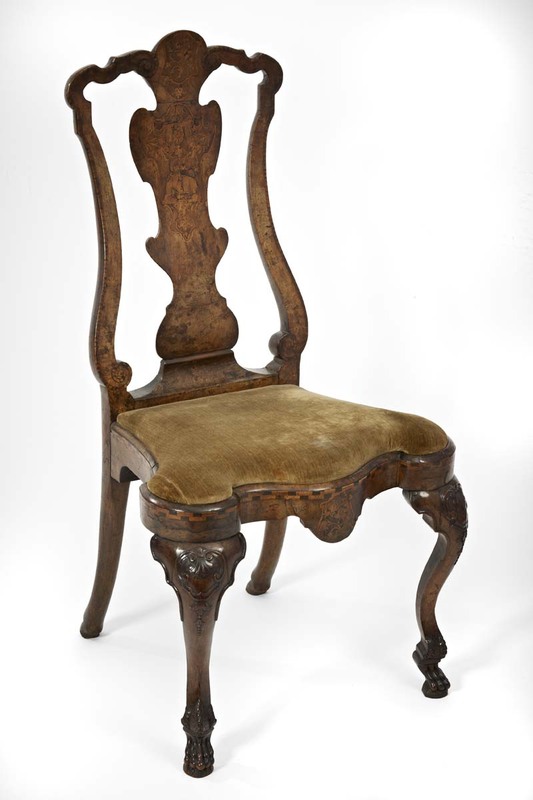 Kilkenny Castle chair, early 18th century (click to enlarge). 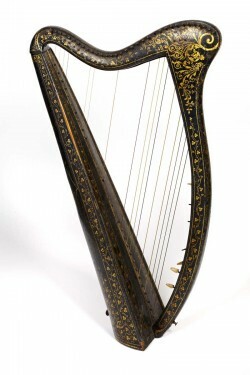 The Egan harp (click on image to enlarge). 19th century furniture and music. (Click to enlarge). Zanobi di Jacopo Machiavelli (1418-1479) Virgin and Child Enthroned with Saints, c.1470 Photo © National Gallery of Ireland. (Click on image to enlarge). Rembrandt van Rijn (1606-1669) Landscape with the Rest on the Flight into Egypt, 1647 Photo © National Gallery of Ireland. (Click on image to enlarge). ANTIQUESANDARTIRELAND.COM would like to wish all our readers a very happy Christmas and a prosperous 2012. These gorgeous images, by kind permission of the National Gallery of Ireland in Dublin, are from the exhibition Masterpieces from the Collection. 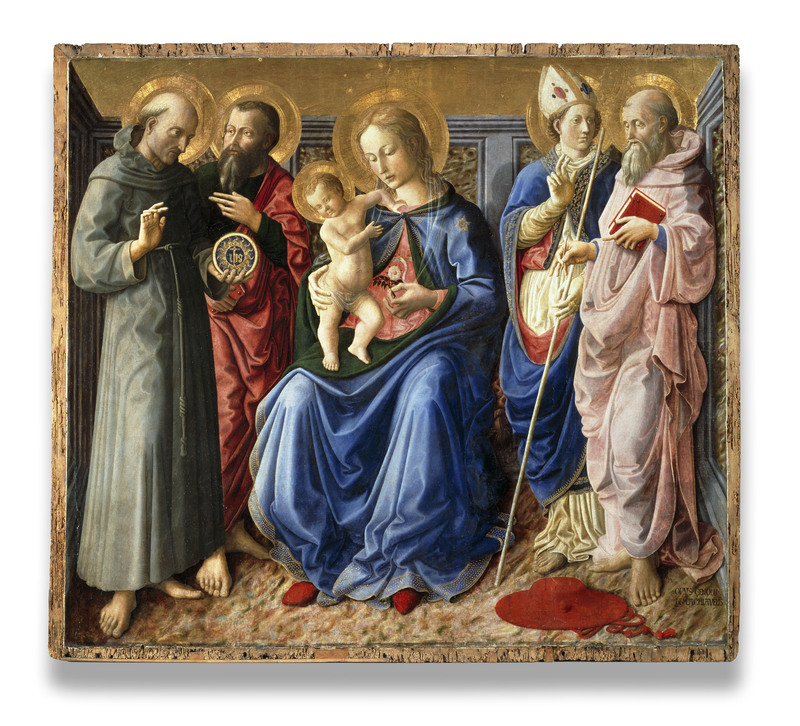 Ongoing throughout 2012 this is a presentation of some of the Gallery’s finest works of art, featuring masterpieces of European art from the early renaissance to the 20th century. 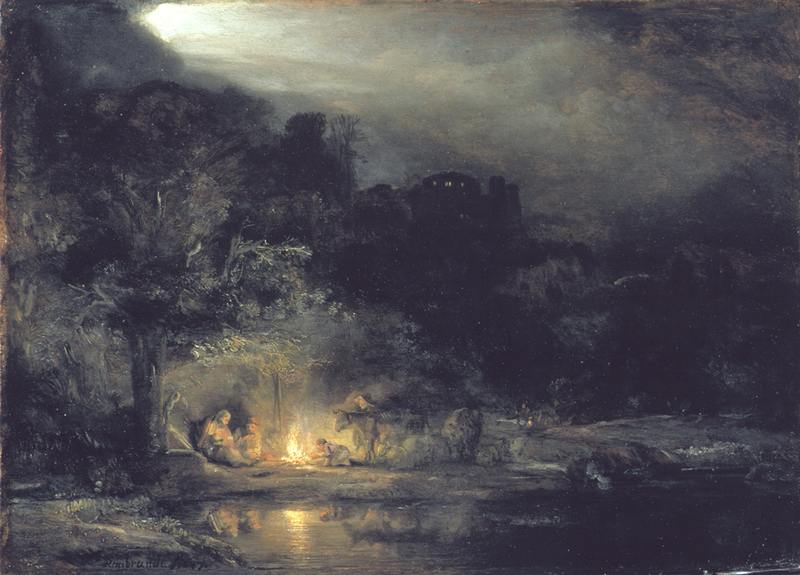 It includes key works from the collection of Irish art from the 17th century onwards. The exhibition is located at the National Gallery’s Beit Wing and the entrance is via Clare St., Dublin 2. Established in 2010 this website has had a steadily increasing number of hits throughout 2011. According to Google’s Webmaster Tools we achieved 550,000 impressions in the month from November 6, 2011 and maintained this figure for several weeks in December. Long may this growth continue. This watercolour by Harry Kernoff (1900-1974) is inscribed Fitzgerald Park, Killarney, 1943. It features in the Eglinton Road auction. (Click to enlarge). UPDATE: IT MADE 5,400. 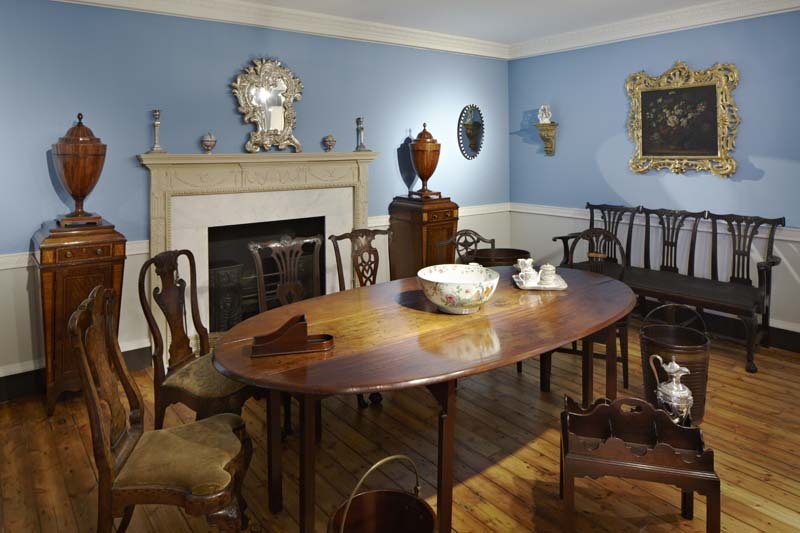 Over 350 lots of antique furniture, art, porcelain, mirrors and books of legal and political interest will come under the hammer at a house auction in Dublin on Thursday, December 29 at 12 noon. Matthews Auctioneers of Oldcastle will hold an on the premises sale at Kildonan, No. 3 Eglinton Road. Furniture lots on offer include a George II chest of drawers, a William IV Irish serving table, a George III kneehole desk, an early Victorian dining table, an Edwardian inlaid side table, a satinwood display cabinet, a George IV two door bookcase, a Victorian gilded overmantle and a pair of Regency hall chairs. Viewing gets underway on December 27 at noon. This was the home of Thomas Teevan, Attorney general in 1953-54 and a High Court judge from 1954-71. He was the judge in the unsuccessful libel action brought by Patrick Kavanagh against The Leader, a cultural magazine. The verdict was later overturned. UPDATE: The auction was highly successful, there was a huge viewing and it was about 95 per cent sold. 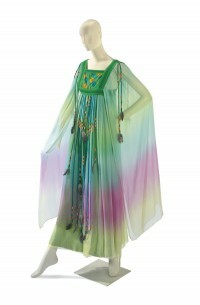 Elizabeth Taylor Collections generate unprecendented global response. 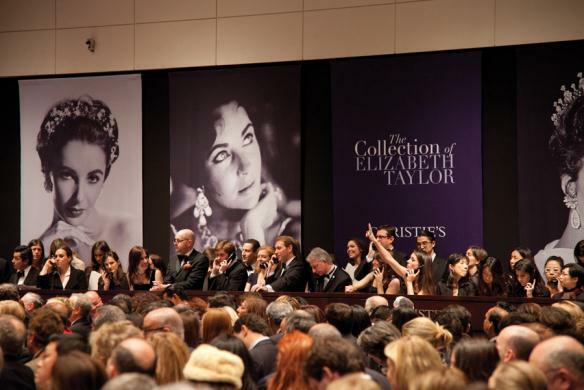 The Elizabeth Taylor auctions brought in a combined total of $156,756,576 at Christie’s in New York. In what turned out to be the most valuable jewelry and fashion auctions in history 26 items sold for over $1 million and six lots sold for over $5 million. Christie’s first ever on-line only auction brought in over $9.5 million in additional sales from the collection. It generated over 57,000 bids. The auctions drew unprecedented interest from bidders throughout the world. They bid in person at Christie’s Rockefeller Centre saleroom, on the phone, on-line and by absentee bid. 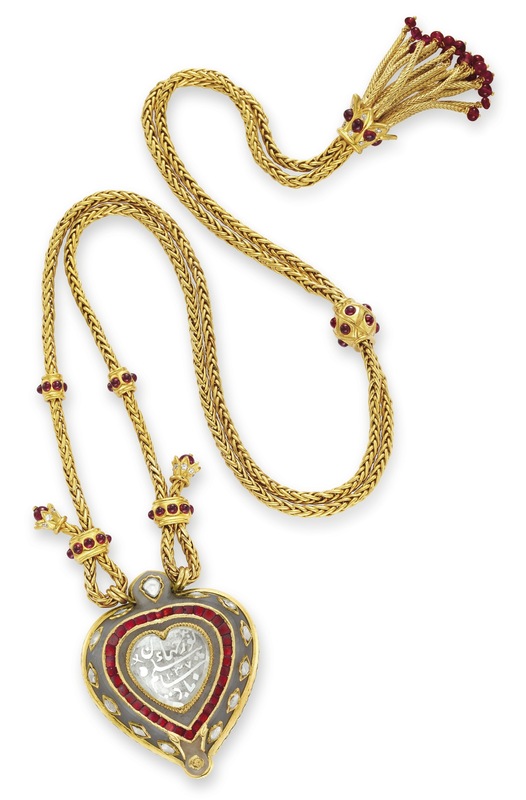 The sale of 1,778 lots of jewelry, fashion, decorative arts and film memorabilia far exceeded Christie’s pre-sale expectations and lots were frequently hammered down for five, ten or even fifty times their estimate. The jewelry sales, for example, had been estimated to bring in more than $30 million, but the combined total for two jewelry sales was $137,235,675. All sales proceeds will be directed to the Elizabeth Taylor Trust. A portion of the profits generated by sales of exhibition tickets, event sponsorships and the ongoing sales of select publications will be donated to The Elizabeth Taylor AIDS Foundation (ETAF). An estimated 58,000 visitors viewed highlights during an eight-city global exhibition and tour in Moscow, London, Los Angeles, Dubai, Paris, Geneva, Hong Kong and New York. Andy Warhol's inscribed picture of Elizabeth Taylor - © Christie’s Images Limited 2011. (Click on image to enlarge). 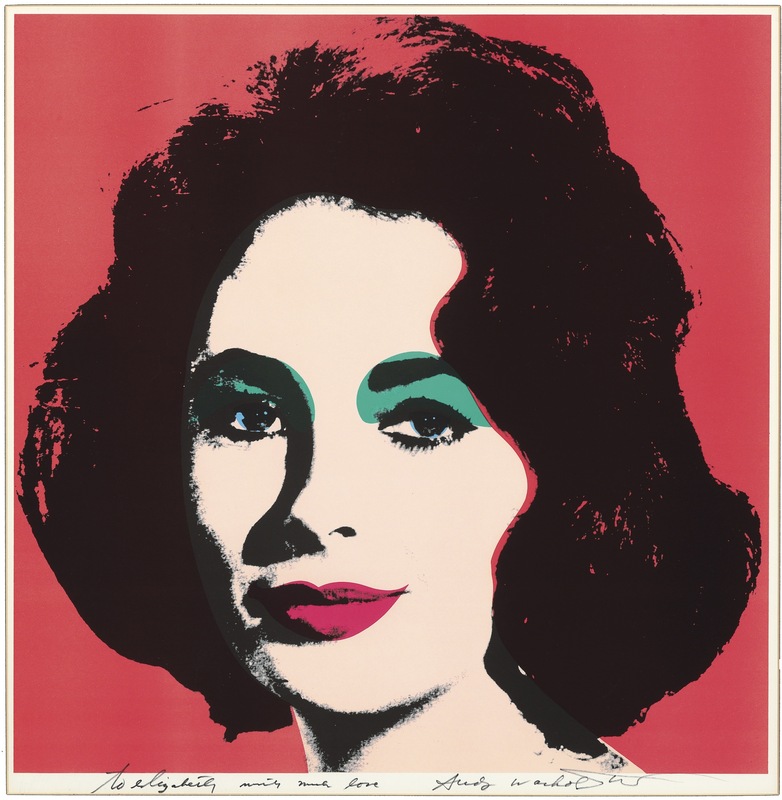 A private Asian buyer paid $662,500 for this inscribed portrait of Elizabeth Taylor by Andy Warhol at Christie’s in New York. The 1964 work carries the dedication: ‘to elizabeth with much love’ from the artist. It is from the edition of approximately 300 published by Leo Castelli Gallery, New York. 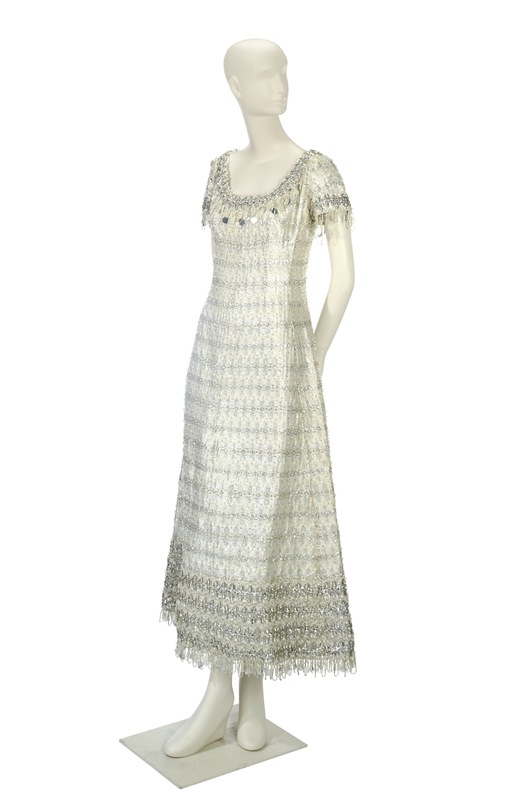 An American museum paid $362,500 for this Christian Dior evening gown of silver encrusted brocade with matching evening bag. Estimated at $4,000-6,000, it was the most expensive item of couture sold. It was worn to Guy de Rothschild yearly ball at Chateau de Ferrières, in Brie, France. (Picture © Christie’s Images Limited 2011, click to enlarge). The catalogue described it thus: Andy Warhol (1928-1987), Liz (Feldman and Schellmann II.7), offset lithograph in colors. This is one of the 12 portraits of Taylor created by Warhol when she was recovering from a serious illness in the early 1960’s. It was part of The Icon & Her Haute Couture Evening Sale which brought in $2,600,750. The two day sale series devoted to the haute couture, fashion and accessories of Elizabeth Taylor made a combined total of $5,586,913. It was 100 per cent sold. Miss Taylor's Gina Fratini wedding dress, worn at her second marriage to Richard Burton in 1975, made $62,500. It was bought by an American museum. (Copyright Christie's Images, 2011, click to enlarge). A collection of Miss Taylor’s Impressionist and Modern Art will be sold next February at Christie’s in London. 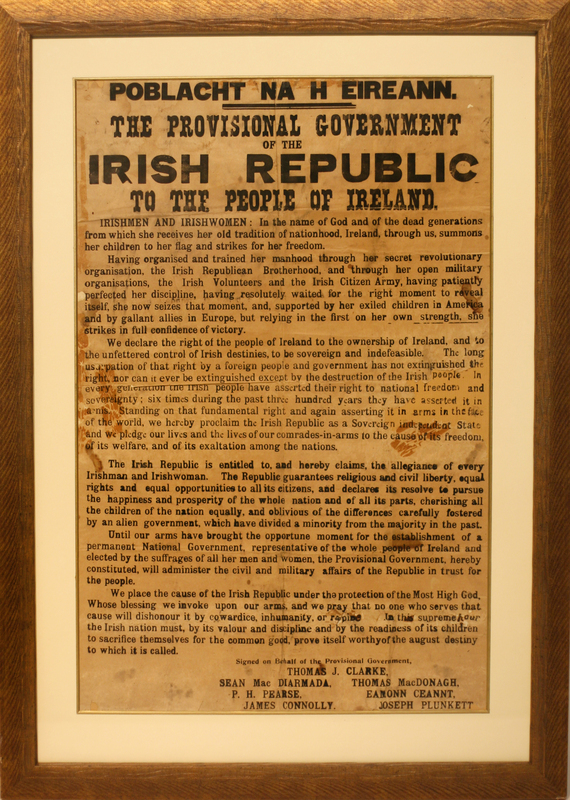 This copy of the Proclamation of the Irish Republic made 55,000 at Mealys. (Click on image to enlarge). 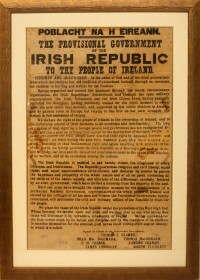 A rare and original copy of the 1916 Irish Proclamation made 55,000 at Mealy’s rare book sale in Dublin on December 13. 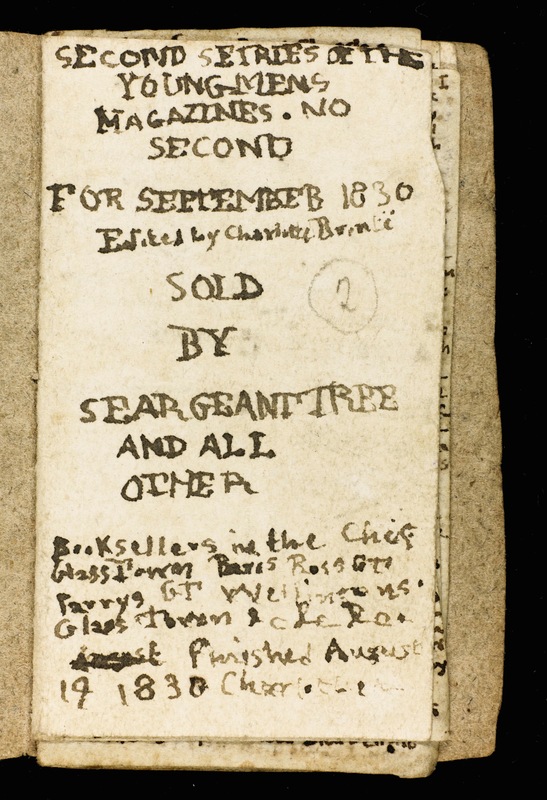 The copy, with a piece torn away from the third paragraph, had been damaged when it was removed from a hoarding. It has been professionally restored. It had been posted in North King St. beside the Four Courts. It was removed by Murty Tubridy from Co. Clare, a volunteer who was grazed in the ear while defending his post nearby. He was taken to the Richmond Hospital, but was advised to decamp if mobile as the hospital was to be raided. About 1,000 copies of the Proclamation were printed. It is reckoned that no more than 40 or 50 originals survived. This one came by direct descent through Murty Tubridy’s family. 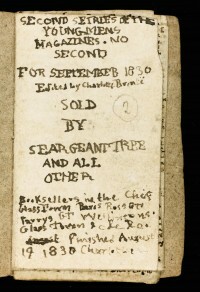 It was bought by a private Irish purchaser. This was the top lot in a sale which brought in more than 500,000 and was 82 per cent sold. See post on antiquesandartireland.com for December 8. La Peregrina, custom designed by Cartier with Miss Taylor, made $11,842,500. The sale of 80 pieces from the Elizabeth Taylor Collection became the most valuable jewellery auction in history at Christie’s in New York on December 13. It made $115,932,000. The top lot was La Peregrina, a legendary pearl found in the Gulf of Panama in the 1500’s. It is 203 grains in size, equivalent to 50 carats. It has been owned by Spanish and French royals and British aristocrats. The pearl was bought for Taylor by Richard Burton in 1969. It made $11,842,500 now, he paid $37,000 dollars then. 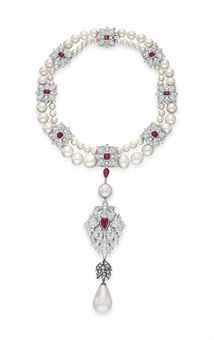 No less than seven new auction records were achieved: price per carat for a colorless diamond and for a ruby; a pair of natural pearl ear pendants; for a pearl jewel and for an historic pearl; an Indian jewel and for an emerald jewel. The scene at Christie's in New York. Christie’s said the atmosphere was electric. “This sale marked the powerful start of Christie’s historic week of sales auctioning the jewelery, fashion, accessories and memorabilia from the Collection of Elizabeth Taylor between December 13-16 in tandem with the online-only sale (December 3-17)” said Marc Porter, chairman and president, Christie’s, Americas. 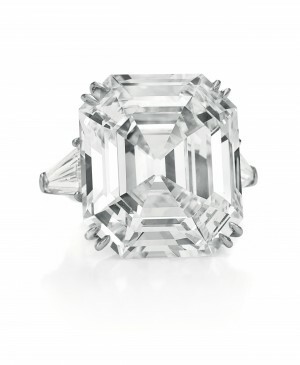 The Elizabeth Taylor Diamond, of 33.19 carats, D color, potentially internally flawless, realized $8,818,500. 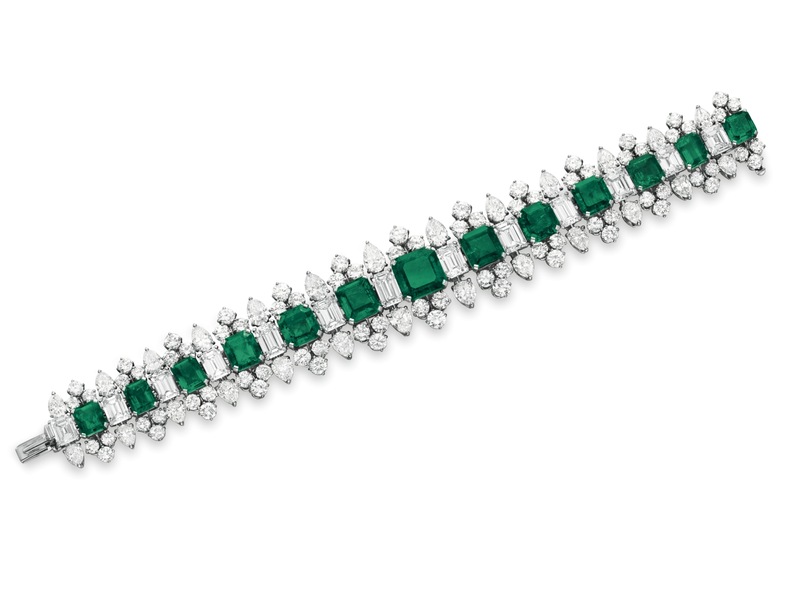 The Bvlgari emerald suite, diamond and emerald jewellery acquired between 1962 and 1967 over repeat trips to Bvlgari on Via Condotti in Rome, realised $24,799,000. It comprises a pendant brooch, necklace, ring, flower brooch, earrings and bracelet. (See examples on the Top Ten which follows this piece). The previous auction record for a jewelery collection was for the Jewels of the Duchess of Windsor which made $50,281,887 US dollars in Geneva in 1987. 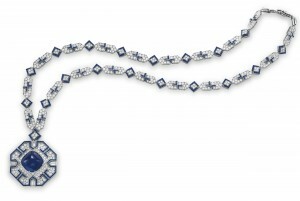 THE second part of the jewellery auction with 190 pieces on offer on December 14 brought in an additional $21,303,575. The Burton wedding bands, two diamond and gold eternity bands from their marriages in 1964 in Montreal and in 1975 in Botswana, sparked a 15 minute bidding battle. They made $1,022,500 over an estimate of $6,000-8,000. 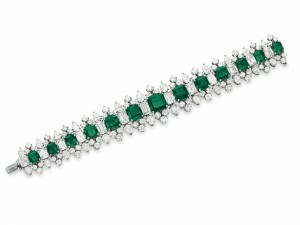 The combined total for the two jewelery sales amounted to US$ 137,235,675. “The spectacular results of the Evening Sale of Elizabeth Taylor’s iconic jewels sparked a surge of interest from collectors around the world. It took eight hours and three auctioneers to sell 190 more jewels from Elizabeth Taylor’s storied collection,” noted François Curiel, International Director of Jewelry at Christie’s. (See posts on antiquesandartireland.com for December 9, December 2, November 14, September 7). 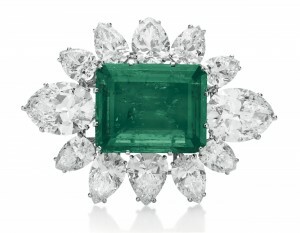 The top ten pieces from the sale of the Elizabeth Taylor jewellery collection at Christie’s in New York on December 13. Click on any image to enlarge it. All images are © Christie’s Images Limited 2011. 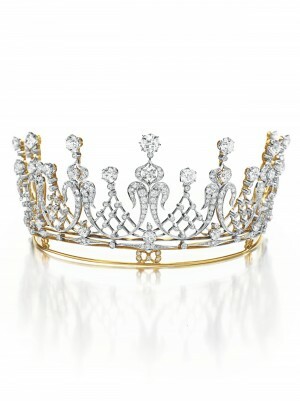 The Mike Todd diamond tiara, an antique c1880 piece, sold for $4,226,500. The Taj Mahal Diamond, circa 1627 – 28, on a gold and ruby chain, by Cartier realized $8,818,500. Inscribed with the name Nur Jahan, wife of Mughal Emperor Shan Jahangir, it set a world record for an Indian jewel. Jahangir was the father of Shan Jahan, who built the Taj Mahal. The Elizabeth Taylor diamond made $8,818,500. AUCTION RECORD FOR A COLOURLESS DIAMOND PER CARAT. It was purchased by a private buyer from Asia. The Richard Burton Ruby and Diamond Ring, of 8.24 carats, by Van Cleef & Arpels, was a gift from Richard Burton, Christmas 1968. 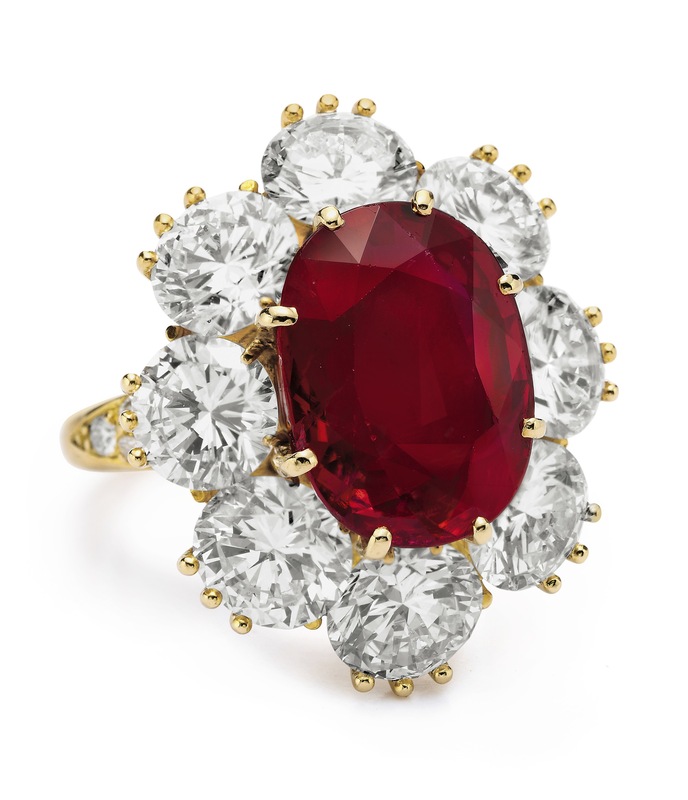 He had promised to buy Elizabeth Taylor a special ruby, with perfect red color, “But it has to be perfect”, he warned. Four years after making his promise, he tucked a small box into the bottom of Elizabeth’s Christmas stocking – so small that she missed it when opening her gifts. 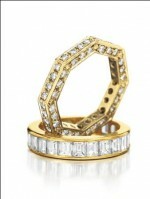 This ring achieved $4,226,500. (Click on image to enlarge). 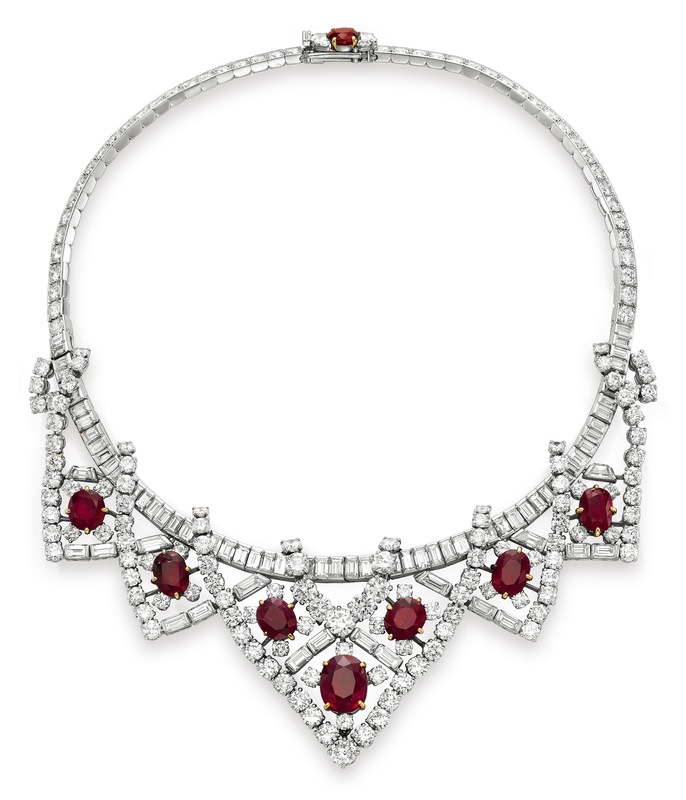 This necklace from the Cartier ruby suite made $3,778,500. It was a gift from Mike Todd in August 1957. (Click on image). 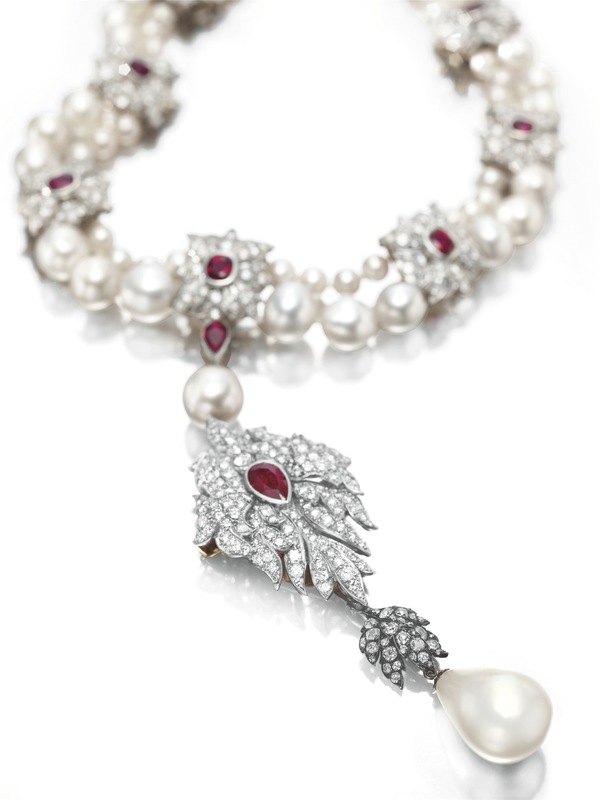 A close up of La Peregrina, the top lot and the world's most expensive pearl. (Click to enlarge). The Bulgari necklace from the emerald suite made $6,130,500. It was a gift from Richard Burton on their marriage in 1964. 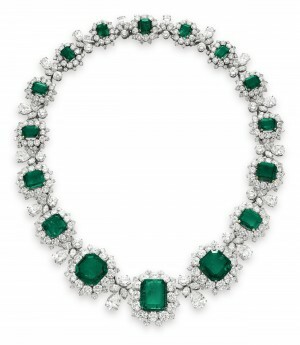 The necklace is set with a graduated series of 16 rectangular cut and square cut emeralds. (Click on image to enlarge). 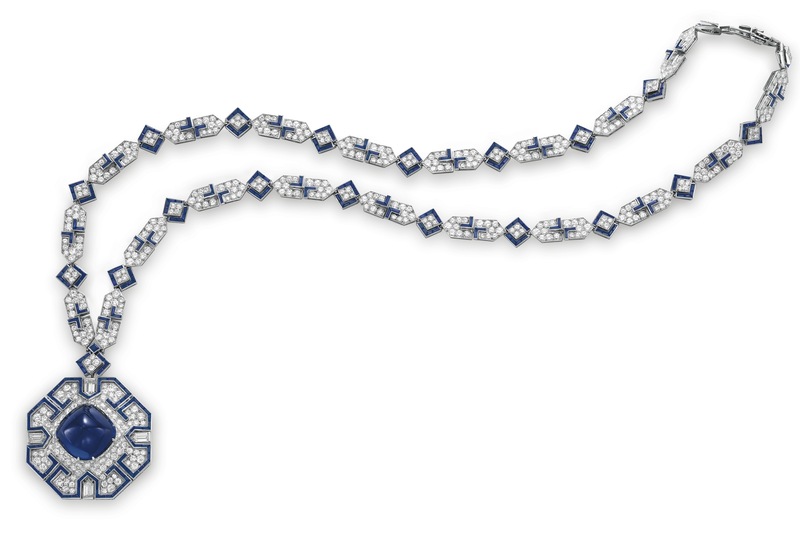 The BVLGARI Sapphire Sautoir, set with a magnificent sugarloaf cabochon sapphire of 52.72 carats sold for $5,906,500. It was an Art Deco gift from Richard Burton for Elizabeth Taylor’s 40th birthday in 1972. (Click on image to enlarge). 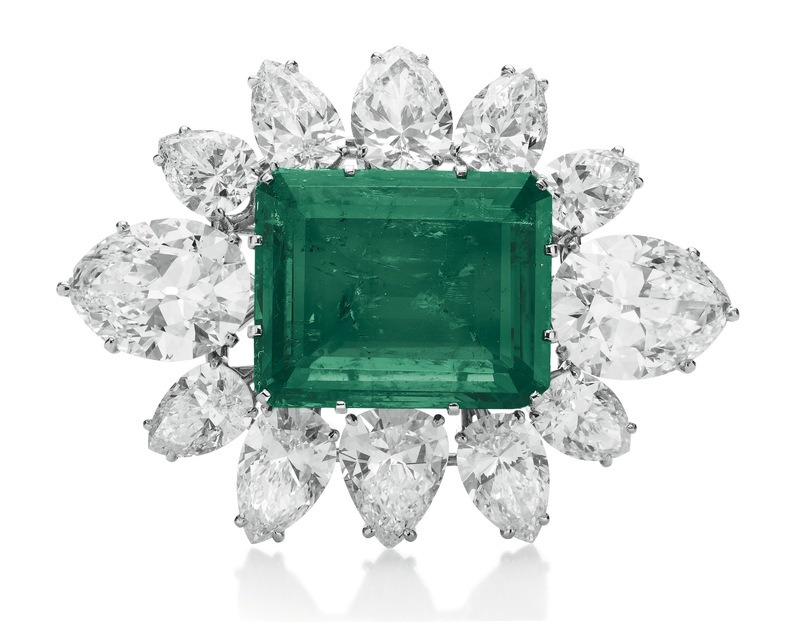 This pendant brooch from the Bulgari emerald suite achieved $6,578,500, a record price for an emerald jewel. (Click to enlarge).